BOSTON – The Boston Athletic Association (B.A.A.) today announced the addition of Dana Giordano to the B.A.A. High Performance Team. Giordano, a resident of Boston and Dartmouth College graduate, brings both professional and top collegiate experience to the team. She will be coached by B.A.A. High Performance Coach Ricardo Santos and makes her B.A.A. High Performance Team debut competing in the Women’s Mile on Saturday, February 2 at the Boston University Bruce Lehane Scarlet and White Invitational in Boston. The objective of the B.A.A.’s High Performance team is to support American runners on their way towards making international teams, with the goal of competing at the highest level: the Olympic Games and IAAF World Championships. The B.A.A. is sponsored by adidas, which provides comprehensive support for the running club, Team B.A.A., and its events. "I am incredibly excited to join the B.A.A. because of its rich tradition of athletic excellence, community connections, and the organization’s aspirations for the years to come,” said Giordano. “My goal in professional athletics is to compete globally at the highest level of our sport while inspiring future generations to improve their lives through running and sport. I am proud to represent the B.A.A. and Boston in the pursuit of my goals." Giordano was an NCAA All-American on the track and in cross country. While at Dartmouth, Giordano won eight individual Ivy League conference championships in distances from the 1500m to 5000m. She earned first-team All-American honors by finishing third at the 2016 NCAA Championships 1500m in 4:11.86, and also by placing 31st at the 2013 NCAA Cross Country Championships. Additionally, Giordano placed 12th at the 2015 NCAA Indoor Championships 3000m (9:16.20) to garner second-team All-American honors. Post-collegiately, Giordano has competed on the professional circuit both in the U.S. and internationally. 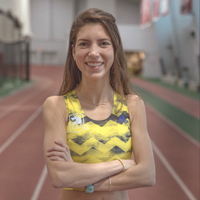 In 2018, Giordano placed 10th in the 1500m at the USA Outdoor Track & Field Championships. She has twice broken 4:10 for 1500m, and last year placed ninth at the B.A.A. 5K in a personal best of 15:47. Giordano competed at the IAAF Diamond League meeting in London’s Olympic Stadium last year, running 8:55.14 for 3000m. For more information on the B.A.A. club, racing team and high performance group, visit www.teambaa.org.